Description: In The Happiness Equation, Pasricha illustrates how to want nothing, do anything, and have everything. 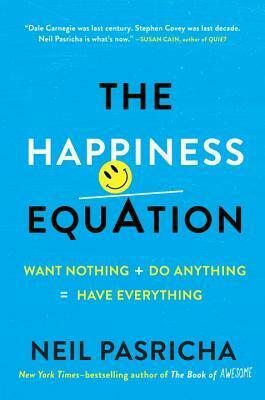 If that sounds like a contradiction, you simply haven’t unlocked the 9 Secrets to Happiness. "If you become angry with me and I do not get insulted, then the anger falls back on you. You are the only one who becomes unhappy. All you have done is hurt yourself. If you want to stop hurting yourself, you must get rid of your anger and become loving instead." "You can move to a shack in the woods to get away from it all! But we'd miss you too much there. Please don't do that."